Even the wind and rain couldn’t extinguish the joy at this celebration! On Sunday, August 5, we gathered to acknowledge the incredible accomplishments of this year’s Heartline Education Center graduates. The air buzzed with excitement as students’ families arrived for the event. Outside the Education Center, beautiful and bright decorations set a celebratory mood for the day. Students’ amazing projects were displayed proudly on tables for everyone to enjoy. 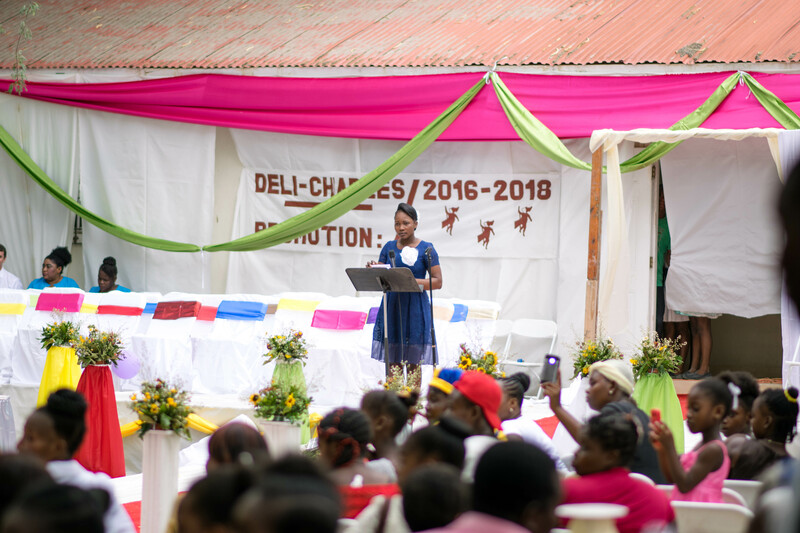 After a particularly challenging year at the Education Center, it was incredibly meaningful to see the graduates gathered together – their faces exuding pride and joy. These men and women not only faced personal challenges, but also persevered through interruptions caused by unexpected leadership and staff changes at the EC. They fought hard throughout the year to arrive at graduation day. 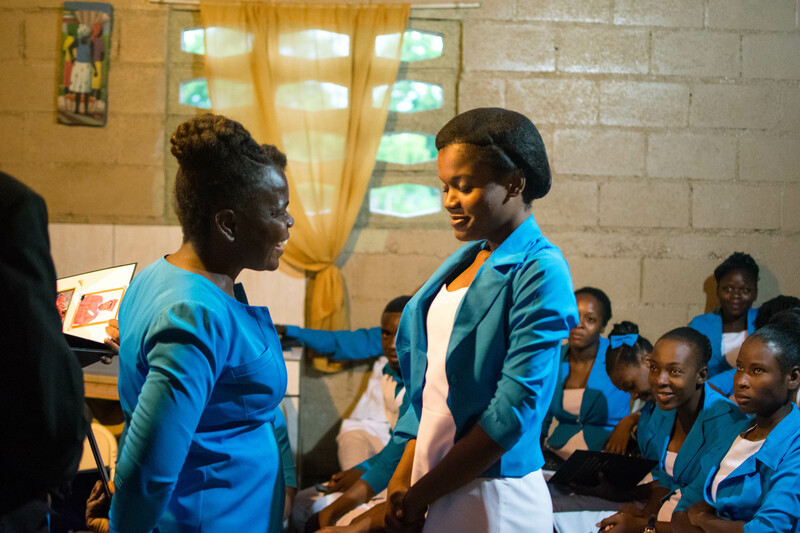 This year’s graduating class included 37 students from two sewing classes, and 12 students who completed a rigorous two year course in Advanced Sewing. 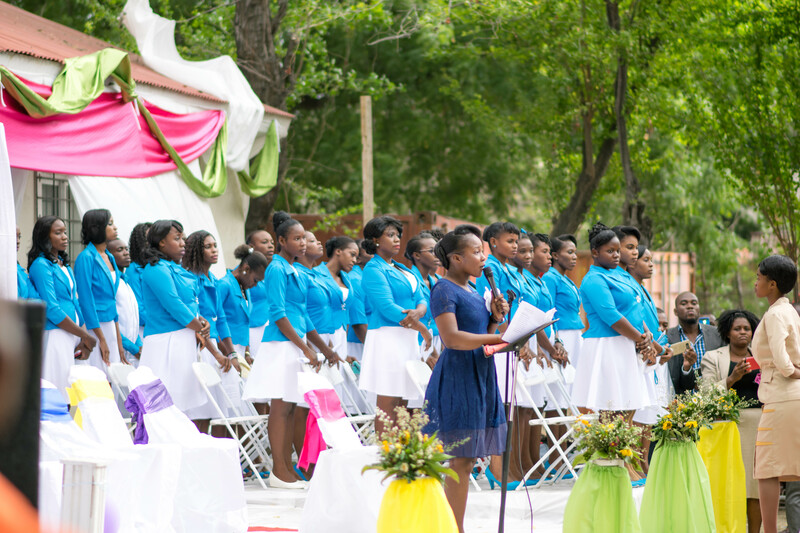 Everyone was captivated by the processional of graduates in their handmade blue and white uniforms. Graduates kicked off the ceremony by joining their voices together in a beautiful song. Unfortunately, shortly after the ceremony started – wind and rain unexpectedly swept in and left everyone running for shelter inside the Education Center. As rain beat down on the metal roof, students and staff decided that they would weather this storm like they weathered the challenges of the year – together. Everyone worked quickly to set up a meeting room inside of the EC so the graduation could continue. Students and staff packed the room, determined to not let the unexpected storm ruin their day. 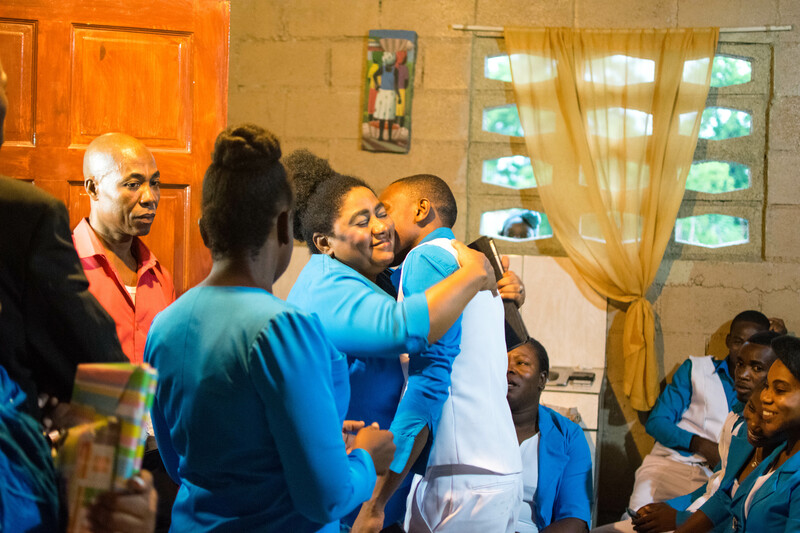 Their loved ones filled the hallways of the school, staying to celebrate the graduates even though they couldn’t all fit into the meeting room. Each student was presented with their diploma and a class photo. Professors also took the time to acknowledge each student’s individual accomplishments and presented several awards. Seeing the students cheer and congratulate one another gave us a glimpse into the unbreakable bonds, friendships, and community built at the Education Center. We could not be more proud of these men and women and can’t wait to see how they use their new skills to start their own businesses, pursue their dreams, and provide for their families. Thank you for standing with these courageous students throughout a difficult year. We have no doubt that there are amazing things ahead for each of these determined individuals! Registration for the 2018-2019 school year is currently underway. 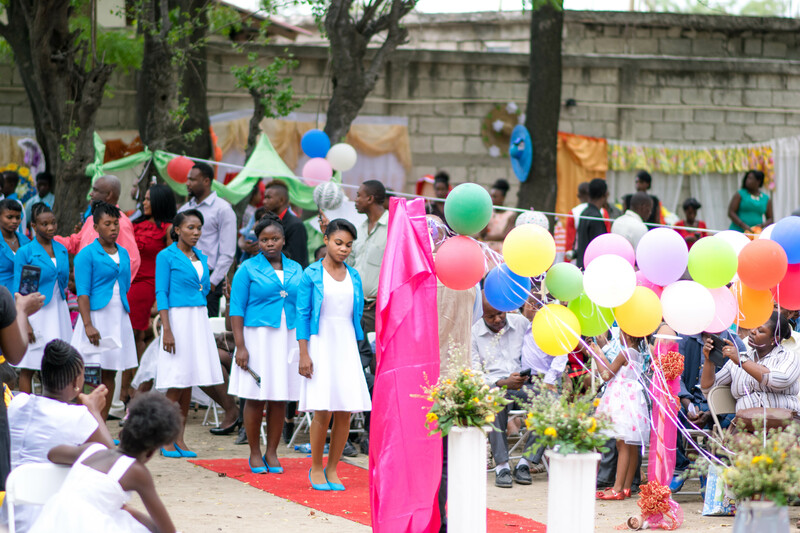 The Education Center will open again this fall, continuing to equip Haitians with income generating skills, empowering them to build a brighter future together.